This week I have got a bigger smile then usual spread across my face as I am going on holiday! For my 30th Birthday my lovely family have bought me a holiday to Ibiza with my sisters (and without the babies eek!). I am so excited to get this party started. I mean it's not even my birthday month yet but the festivities have definitely begun. 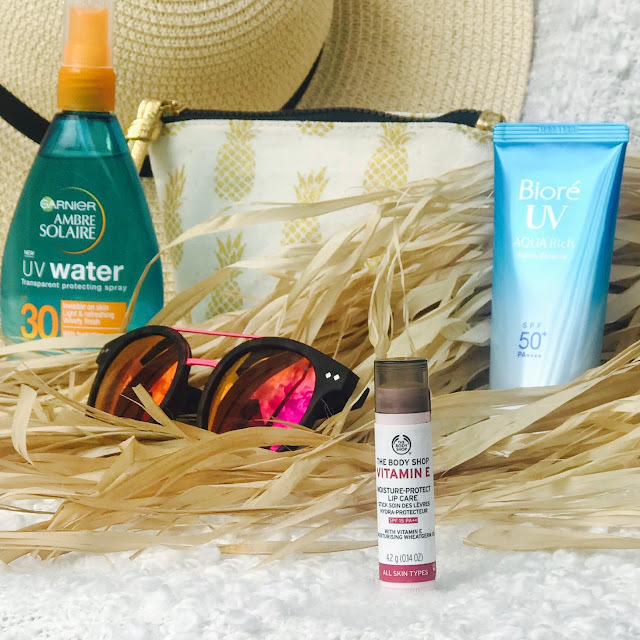 Going on holiday can be really stressful and there always seems to be something I forget, however one of the most essential things for holiday, especially if you are going somewhere hot, is your Sun Protection Factor or SPF as we like to call it. A good sun cream will have a high rating for both of the the sun's UVA (ultraviolet A) and UVB (ultraviolet B) rays. These are responsible for premature skin ageing, skin cancer and damage to the eyes, which no one wants. 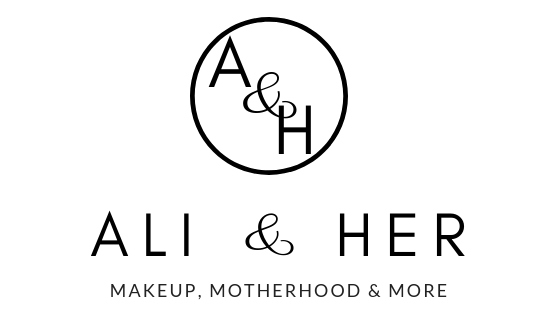 I have collated a few products I love to use to guarantee protection and popped them into a post for you so that is one thing off your to do list! This is the most lightweight high coverage SPF I have ever tried. I can't take credit for finding it as it was recommended to me by both Fashionicide and Svphie. It seriously hasn't disappointed and literally melts into the skin. I can't believe how there is no resonance of any product left on your skin. That horrible greasy feeling is but a distant memory of long ago and I think more and more brands are striving to achieve this non sticky texture. I tend to use this solely on my face as I do not want to add any grease to an already greasy situation and from a price point it is quite pricey for the amount of product you are getting. So I justify it by using it solely on the face. It just fits in perfectly as the last step of my skincare routine. This has become something I apply daily, rain or shine. Now as SPF goes, this is on the total opposite end of the spectrum when it comes to greasiness. It is very heavy and thick in consistency but light enough to be able to be 'sprayed' on. Technically this doesn't exactly spray for me but kind of squirts out into little puddles. I find it a better way of applying rather than squeezing into my hands. It is just a way of spreading the cream out really. However even though this is on the heavy side, I use this all over my body and on my children. Price wise it is pretty cost effective and I don't mind my body being greasy as much. I also prefer the consistency on my kids as it makes me feel like they are actually protected as I can visually see the product. This is not for everyone, but it does the job. It is also water - resistant so perfect for the pool. 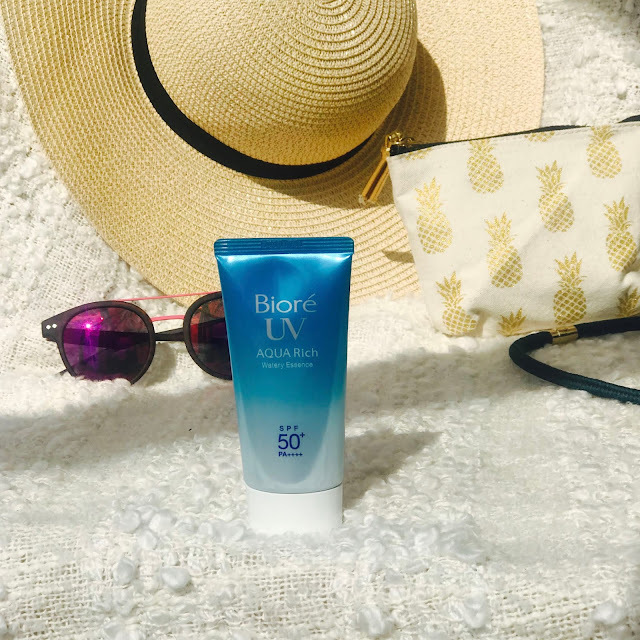 This beauty of a product is perfect for topping up your SPF, maybe when you are out and about or lounging by the pool. It is transparent in colour and does actually spray out of the bottle as it is very thin in consistency. It feels quite hydrating and this could be due to the fact it contains Aloe Vera Water. Once again you are not left with any residue but more of a velvety feel just as the bottle suggests. 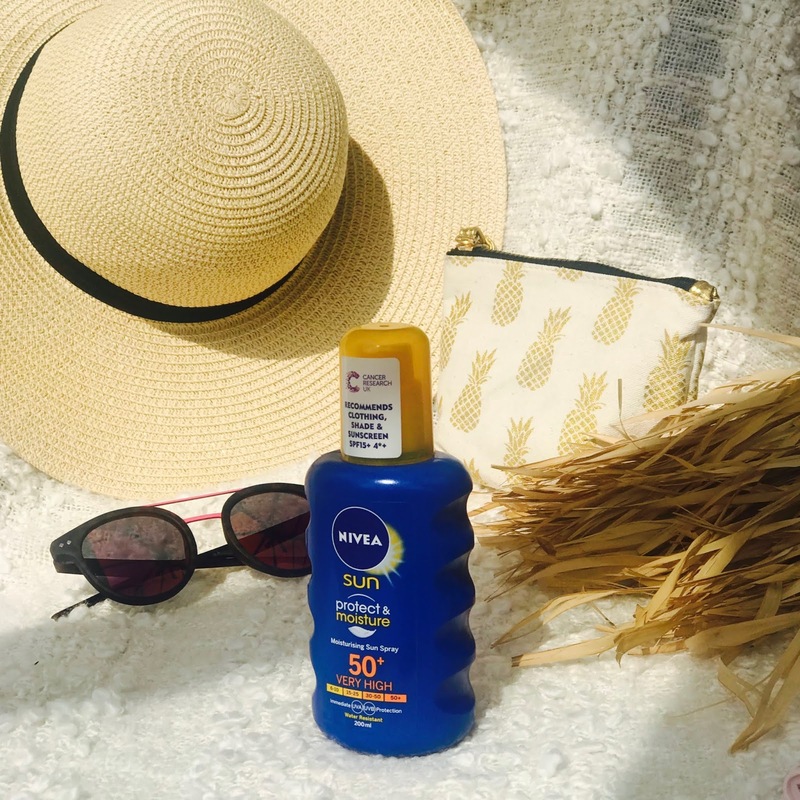 Unfortunately it doesn't come in a SPF 50, however I think it is ideal for when I have had my Nivea Sun on for a while and it may be starting to wear away and I just want to top up for that extra protection. 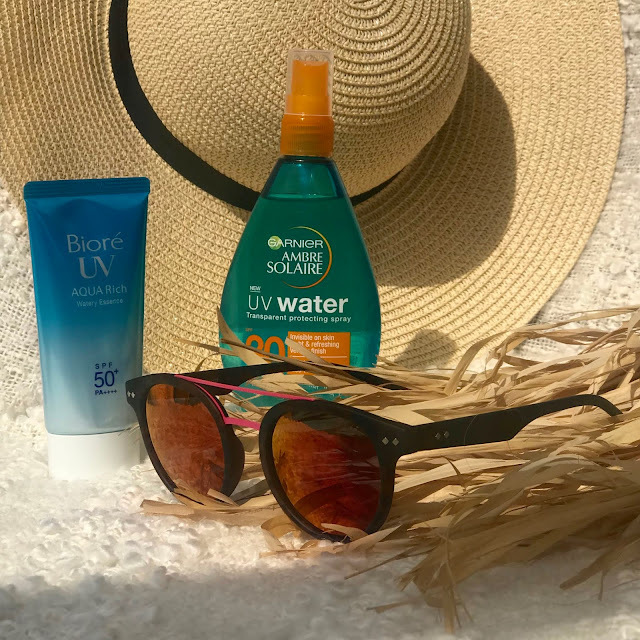 Once again it is water-resistant and protects you from UVA and UVB so therefore protects against short term and long term effects of the sun. I bought this a few weeks ago and I have been wearing it everyday. I know I definitely do not think about lips when it comes to sun protection but recently I have noticed my lips have been getting slightly darker and I put it down to the month long drought that we are going through. I have never experienced this type of heat before in the UK and for so long, so this is me taking my skincare to the next level. SPF for lips is essential now! 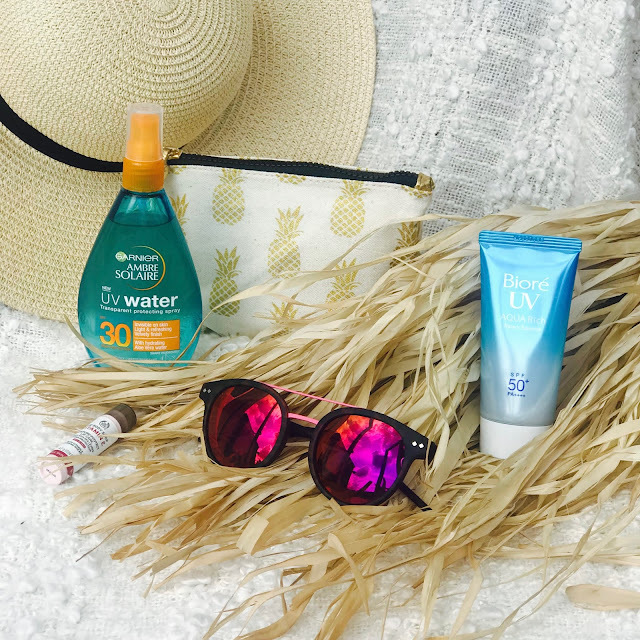 Once again sun protection doesn't just stop at the skin. 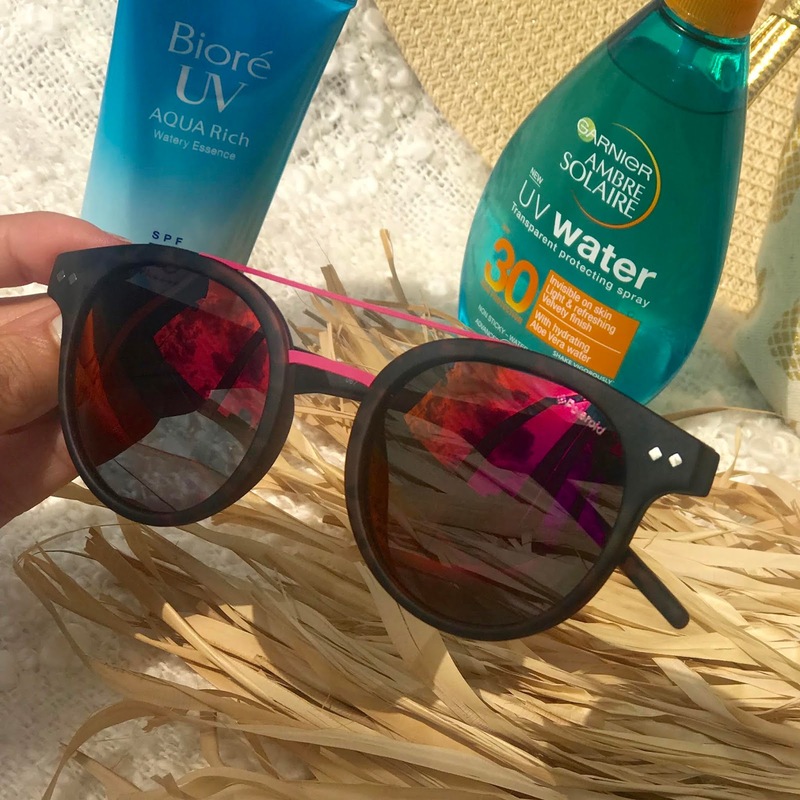 UV can be harmful to the eyes so wearing sunglasses in the sun is very important. Some people mistake them for a simple fashion accessory but they are so much more than that for me. Too much sunlight can cause me severe migraines so I always make sure if it is really bright outside I have my sunnies on, especially when driving. These Polaroid sunglasses have 100% UV protection and are also polarised meaning they reduce glare, so sharpen your vision in intense sunlight. The Sunglasses Shop have such a great range of sunglasses all with great protection, in a variety of styles to suit everyone. They even include measurements in the description to make it easier for you to select a style to suit yourself. So this is what I am using and I hope you find this post helpful. 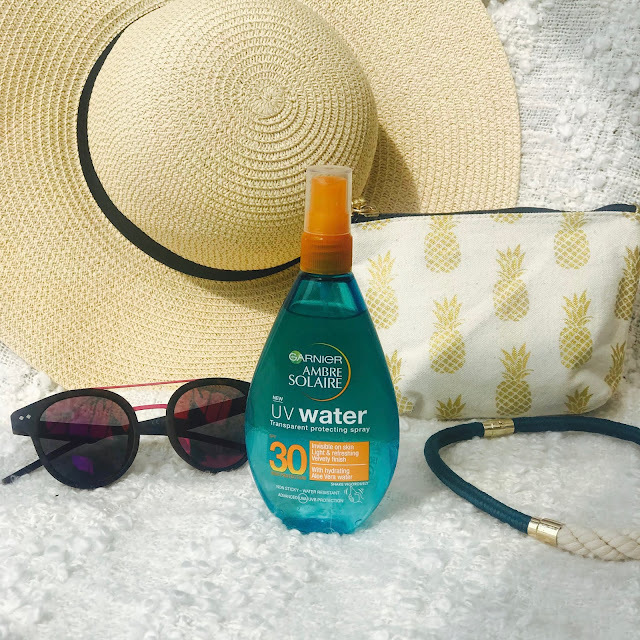 Be sure to keep protected while the lovely weather lasts. Please let me know any other SPF's you would recommend in the comments below. Recent Skincare: To buy or not to buy?